running on the host machine. 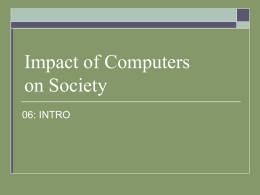 • Computers often run several programs at the same time. link. This is called node-to-node delivery. normally processes in the application layer. does the work is called the transport entity. on the network interface card. two types of transport service. the connection-oriented network service in many ways. establishment, data transfer, and release. very similar to the connectionless network service. 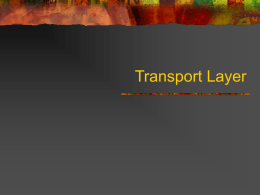 transport service has its own interface. system call to block the server until a client turns up. the caller and sending a packet to the server. 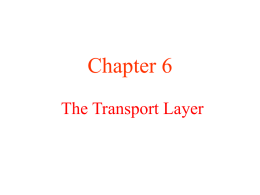 layer message for the server's transport entity. packets (exchanged by the network layer). (exchanged by the data link layer). RECEIVE to wait for the other party to do a SEND. then process the TPDU and send a reply. to send, this scheme works fine. 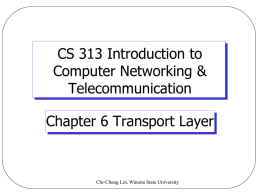 complicated than at the network layer. • Upon arrival, the connection is released. separately, independently of the other one. 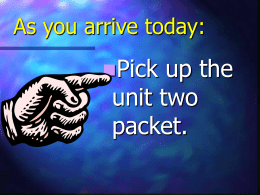 transport user or an incoming packet. 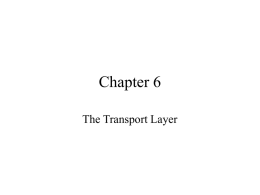 Environment of the transport layer. 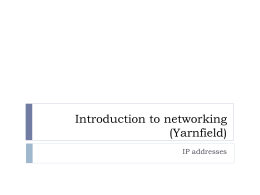 line uniquely specifies a particular router. not there). Either way, there is not much to do. more complicated, as we will see. existence of storage capacity in the subnet. an inopportune moment 30 sec later. the use of special protocols. approach than we used in the data link layer. end points are called ports. generic term TSAP, (Transport Service Access Point). a time-of-day server in host 2.
address that is known in advance. • In short, a better scheme is needed. address of the service they want. exist independently of the process server. wants to talk to it. a name server or sometimes a directory server. • connection to the name server (which listens to a wellknown TSAP). • network can lose, store, and duplicate packets. person, and then releases the connection. and stored in the subnet. transfer money (again), and release the connection. • The bank has no way of telling that these are duplicates. transaction, and transfers the money again. (peer transport entity, connection identifier) pairs. which connection identifiers have already been used. mechanism to kill off aged packets that are still hobbling about. the problem becomes somewhat more manageable. 2. Putting a hop counter in each packet. the (now known) longest possible path. decremented each time the packet is forwarded. whose hop counter becomes zero. has the effect of making T longer. proposed equipping each host with a time-of-day clock. 2. The clocks at different hosts need not be synchronized. counter that increments itself at uniform intervals. sequence number (also k bits). sequence number are long gone. 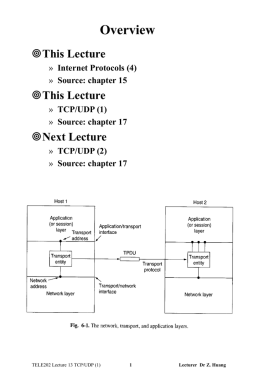 protocol can be used for data flow control. know where it was in the sequence space. large, so this strategy is unattractive. restriction on the use of sequence numbers. and let the clock tick once per second. opened at time x will be x.
connection 5 is given sequence number 80. • Call this TPDU X.
host crashes and then quickly restarts. initial sequence number 70 as required. 80 will be rejected as a duplicate. that it is not in the forbidden region. sequence number versus time curve. clock tick (a few μsec or less). agree on the initial sequence number. the presence of delayed duplicate control TPDUs. • This TPDU arrives at host 2 without host 1's knowledge. indeed trying to set up a new connection. way, a delayed duplicate does no damage. y are still in existence. host 2 that this, too, is an old duplicate. receiver also releases the connection. is saved by the timer. • When the timer expires, the connection is released anyway. • delivered correctly and on time. • repeated attempts to retransmit the DR also fail due to lost TPDUs. • just gives up and releases the connection. 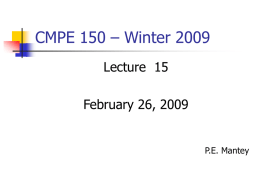 retain copies of the TPDUs it sends. sender will have to buffer anyway. still remains the question of the buffer size. pool of fixed-sized buffers presents problems. long TPDUs, with the attendant complexity. machine have to use it. needed to tell which process to give it to. rate on 390 each one. operandi is called downward multiplexing. from these crashes becomes an issue. 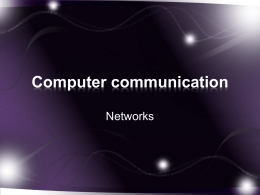 from network and router crashes is straightforward. know how to cope with them.